Mariners Latest: Vargas Win's Again, Taming The Tigers! Vargas Win's Again, Taming The Tigers! The Mariners got to work early in the first inning with a lead off walk to Chone Figgins. Dustin Ackley followed up with a single and that sent Figgins to third base. First and third, no outs. Sound familiar? This time, the Mariners did something with the situation. Ichiro Suzuki came to the plate next and popped out to second base and the thoughts that ran through my head were not great. Then came Jesus Montero. Montero hit a single, scoring Figgins and moving Ackley to 2nd. Kyle Seager popped out to shortstop to take after Ichiro with an epic fail as nobody was able to advance. Then came Alex Liddi. Liddi hit a grounder to shortstop for a hit and loaded the bases, but Michael Saunders came up and whiffed for the final out of the inning. So we didn't do a lot with the inning, but I'll take one run over zero runs. In the 3rd inning the Mariners broke things open a bit. Ackley led off with a walk and Ichiro singled, so we had runners at 1st and 2nd with nobody out. Jesus Montero flew out, nobody advanced. Kyle Seager hit a single to center field and scored Ackley and moved Ichiro to 2nd. Alex Liddi struck out and up came Michael Saunders to the plate with two outs. 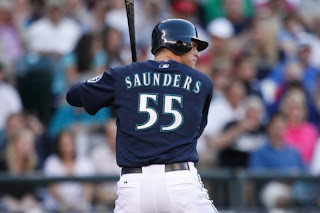 Saunders hit a double over the head of Ryan Rayburn scoring Ichiro and Seager. All of a sudden, M's were up 4 - 0. Miguel Olivo followed with a hit but Saunders and Olivo were stranded on the base paths after Munenori Kawasaki flew out to center field. Jason Vargas had been absolutely cruising through the first 2 innings, but in the 3rd, Brandon Inge hit a ball deep into center field to Saunders. Saunders had it in his sights, reached out, I thought he had it, but it went off the heel of his glove and Inge was able to scoot in with a one out double. A play that should have been an out but instead resulted in a run on a Brennan Boesch single. Even worse, the 4th inning. Prince Fielder led off with a single off of Jason Vargas. Vargas made a play after it bounced off his legs and gunned it to 1st base. The throw clearly beat Fielder but the first base umpire, Jim Joyce, called Fielder safe. Jim Joyce happens to be the same umpire that ruined Armando Galarraga's perfect game. Vargas got the next two outs and would have been out of the inning. Instead, Alex Avila came up to the plate and hit a two run homer and made the score 4 - 3 and all of a sudden the Tigers were back in the game. Mariners had the first two runners on in the fifth and got one run across on a fielder's choice and that was all. Seager and Liddi singled and Liddi stole 2nd. No out, Saunders struck out. Olivo hit into the fielder's choice and got the RBI and then got caught stealing 2nd base. Yeah, Olivo was trying to steal 2nd. Mariners were up 5 - 3. After a blast to left field by Miguel Cabrera made the score 5 - 4, the Mariners took it from there. They scored a run in the 7th on a Alex Liddi homerun and a run in the ninth on a Saunders double. They tried to score pinch runner Casper Wells from first but he was gunned down at the plate. The combination of Steve Delabar, Tom Wilhelmsen and Brandon League made it through three innings of work and didn't allow a run. Wilhelmsen walked the tight rope in the 8th, but ended up striking out the last two hitters after allowing the tying runs into scoring position. In other words, Big Tom made the Tigers offense look just like the Mariners. It was pretty amazing. Interesting tidbit, after Kyle Seager popped out in foul territory with runners on 1st and 2nd with nobody out the television cameras panned over to the dugout and you could see Eric Wedge just fuming. Cursing under his breath, biting his lip and wouldn't even look at Seager as he entered the dugout. Then of course, Liddi ended up striking out for the 2nd out. Saunders actually saved the day when he hit the double. I'm sure we'll see something come of this, Wedge was not happy at all. Maybe it will all be washed away now that they got the win. Maybe not. I guess we'll find out tomorrow in game 2 of the series with the Motor City Kitties. GO MARINERS!! !